A bee sting treatment is a necessity because stings can be very dangerous for some people. In fact, for people that fall in this category, a bee sting may lead to serious health problems and death if proper treatment procedures are not followed and followed quickly. However, for the majority of the population, bee stings will not cause significant problems. Usually only minor discomfort of the skin and body will occur for a few hours or possibly a couple of days. A bee sting treatment protocol in these cases will help to relieve the minor symptoms that occur so that the individual that was stung will be more comfortable. The bee sting remedy that should be used depends on the severity of the reaction or the symptoms being experienced by the individual. All individuals that are stung usually require general bee sting first aid procedures, but in allergic reaction situations, emergency medical care is required immediately. The basic bee sting remedy is to remove the stinger from the skin as quickly as possible if the bee left the stinger behind. A raised welt on the skin with a small black dot indicates the location of the stinger. The stinger is a small barbed sliver that has a venom sac attached to it. This stinger and sac combination means that if it is left in the skin after the bite, venom will continually be deposited into the skin for at least another 20 minutes. 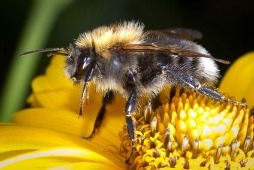 In addition, a pheromone will be released that will signal other bees in the area to sting as well. Therefore, the first two essential bee sting treatments are to flee the area first to prevent multiple stings and then remove the stinger quickly afterwards. Initially, recommendations to remove the stinger involved using a flat, stiff object such as a fingernail, credit card, or knife blade to lightly scrape out the stinger. It was speculated that if the stinger were squeezed by pinching with fingers or by using tweezers, additional venom would be injected into the skin of the victim. However, a study in 1996 tested this theory and found that it is more important to remove the stinger as quickly as possible by whatever reasonable means available. Any delays will result in more venom being injected into the skin that would have been injected by squeezing the stinger. Therefore, use of tweezers or the fingernails of your thumb and forefinger to grab and remove the stinger is acceptable. The key is to remove the stinger quickly. Once the stinger has been removed, then it is prudent to focus on treating the bee sting symptoms that the victim is experiencing. If there is no indication of allergic type symptoms, then there are some general bee sting treatment procedures that can be followed. After being stung, it is important to stay calm. Panic will only lead to the symptoms becoming more severe. It is a good idea to wash the skin wound with soap and water or if soap and water are not available, use alcohol or other suitable antiseptic in order to help prevent infection. Avoid touching or scratching the area. If the bee sting was on the arm or leg, elevate the affected body part to limit the flow of body fluid to the area and to reduce swelling. Apply a cold compress or an ice pack, off and on for twenty minutes at a time. The cold temperature helps to soothe the pain and reduce swelling. Various skin lotions can be used to reduce itch, swelling, and pain. For example, calamine lotion, hydrocortisone cream, or combination creams that contain an antihistamine, an analgesic, and a corticosteroid are often useful. There are also over-the-counter skin products specifically designed for the treatment of minor symptoms. Another useful bee sting treatment is to use an oral antihistamine. Antihistamines will help reduce swelling, itch, hives, redness of the skin, and help prevent the reaction from spreading. For pain, acetaminophen or ibuprofen can be used. Various home remedies have been suggested as bee sting treatments. One example is to make a paste of baking soda and water, and applying this to the sting site for approximately 20 minutes in order to reduce itch and soothe the area. Alternatively, a wet tea bag can also perform the same function. Note that a person with a bee sting with no immediate allergy symptoms should be given the basic bee sting treatment and then closely monitored for a while to ensure no allergic reaction occurs. People may not know whether they are allergic or not and some people may become allergic after the first or subsequent stings. A serious allergic reaction will usually occur within an hour. In very rare cases, a serious reaction may develop after several hours or up to a day after the sting. About 3 to 5 percent of the population have some sort of allergy to bee stings. About 1% of these will go into anaphylactic shock. If the victim is experiencing symptoms that indicate an allergic reaction is taking place, then the best bee sting treatment is to get emergency medical help immediately. A few minutes lost could be the difference between life and death. Emergency medical bee sting treatment may include: injections of epinephrine, antihistamines, and corticosteroids as well as breathing support. Individuals that know they are allergic should wear a bracelet to alert others and medical professionals of their bee sting allergy. They should carry essential bee sting treatment tools for allergic individuals such as an adrenaline auto-injector (Epipen). The auto-injector can be used to restore breathing in the allergic victim while waiting for emergency medical assistance to arrive. Having an antihistamine on hand is also recommended. For individuals that react severely to bee stings, venom immunotherapy could be a bee sting treatment that could be pursued. This involves giving traces of the venom to the individual until they become immune to it. Some reports claim that this type of immunotherapy can be up to 90 percent effective. Other situations where emergency assistance is recommended is when there are multiple bee stings, or if the sting or stings occurred inside the nose or mouth/throat area. Stings in these areas may affect breathing and therefore should be dealt with quickly by medical professionals.